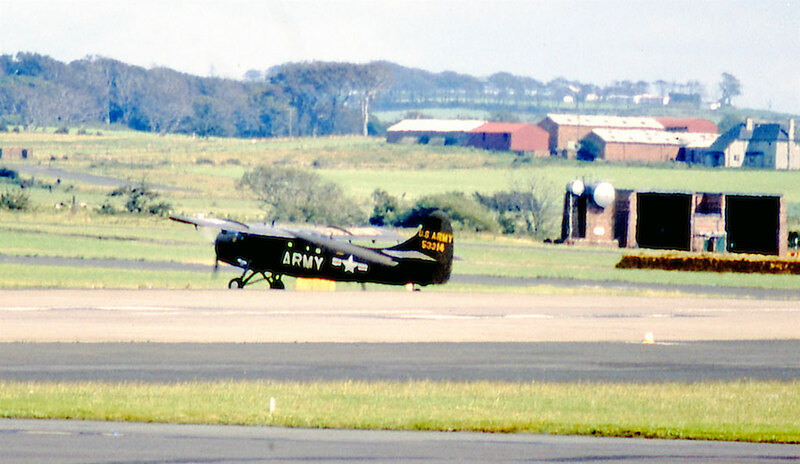 55-3314 on another visit to Prestwick - EGPK, Scotland. • 55-3314 United States Army. Delivered 28-Nov-1956. Designated as U-1A. It first served with the 3rd Aviation Company, Fort Riley, KS. July-1957. Moved with the unit to Illesheim, Germany until disbanded in Nov-1959. Note: Logged by Neil Aird at Prestwick – EGPK on 01-Aug-1964. Nov-1959. 2nd Aviation Company in France, where it served until July 1966. Jul-1966. 4th Armoured Division until Oct-1967. Aug-1968. 54th Aviation Company, Vung Tau, Vietnam. Deployed to Bangkok, Thailand with the 54th Aviation Company as a liaison aircraft. Late 1969. Transferred to the Military Assistance Command Thailand (MACTHAI). Jun-1971 Returned to the 388th Transportation Company, Vung Tau, where it was scrapped. Aug-1971. Deleted from Army inventory. Otter 177 was delivered to the United States Army on 28th November 1956 with serial 55-3314 (tail number 53314). It first served with the 3rd Aviation Company, Fort Riley, Kansas and moved with the unit when it deployed to Germany in July 1957, establishing at Illesheim. 53314 was noted visiting Gatwick Airport, London on 19th January 1959. The 3rd Aviation Company disbanded in November 1959. 53314 then joined the 2nd Aviation Company in France, where it served until July 1966. It then continued to serve in Europe with the 4th Armoured Division until October 1967, when it was transported back to the United States and then onwards to Vietnam. It arrived with the 388th Transportation Company, Vung Tau in May 1968 and was prepared for service, joining the 54th Aviation Company in August 1968. With the 54th Aviation Company 53314 was based at Bangkok, Thailand where the unit had a tasking to base an aircraft for liaison purposes. The Otter is mentioned in the unit history for October 1969:”The final crew from the 54th departed for Bangkok to pull a transfer inspection on 53314. It was being transferred to the Military Assistance Command Thailand (MACTHAI) who will furnish their own flight crews in the future”. That month 53314 was transferred to MACTHAI where it continued to serve until June 1971, alongside 53316 (180). Both Otters were then flown back to Vung Tau where they were scrapped, and were deleted from the inventory in August 1971.